What does a retired NBA star from China have in common with one of the biggest video game makers? They have both started their own wineries in Napa. Yao Ming was introduced to red wines at the steakhouses he frequented while playing for the Houston Rockets. “We do have a lot of beef over there and obviously steak and red wine is a really good combo. It’s really good for people to enjoy their life with those two,” Yao said. Kenzo Tsujimoto is the head of video game company Capcom. He’s a long-time wine lover and he’s been coming to California on business for some 30 years. “I came to realize that Napa produces the best wine in the world and therefore that really made me think of starting a winery,” Tsujimoto said. 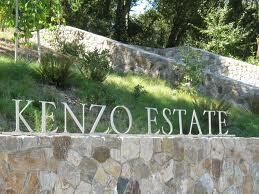 Tsujimoto’s small Kenzo Estate winery rests on a former horse ranch overlooking the Napa Valley. Tsujimoto bought the sprawling 3,800 acre property 13 years ago.